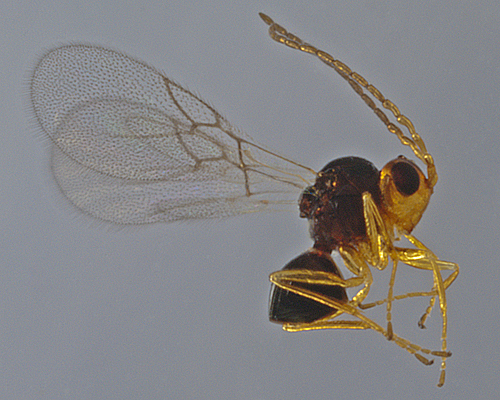 The adult apterae of Macrosiphoniella absinthii (see first picture below) are reddish-brown and partly wax-powdered. The head, antennae, legs, siphunculi and cauda are black, and there is a black spot in the centre of the abdomen which is highlighted by a white surround of powdered wax. The spinal body hairs and some of the pleural body hairs of Macrosiphoniella absinthii are placed on dark scleroites, some of which are fused into larger sclerites of cross bands (see first micrograph below). The hind tibiae are black from the base to apex. The siphunculi are very thick and short, 0.13-0.16 times the body length and 1.0 to 1.1 times the length of the cauda; they are reticulated on their apical 48-60%. 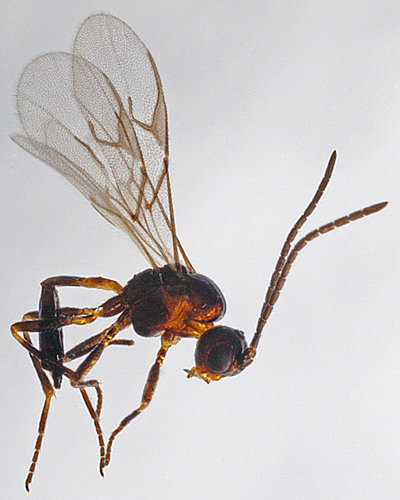 The body length of the adult Macrosiphoniella absinthii aptera is 1.7-2.5 mm. The alate viviparous female (see second picture above) is much like the apterous viviparous female, but the sclerites are less developed and the siphunculi are more slender. 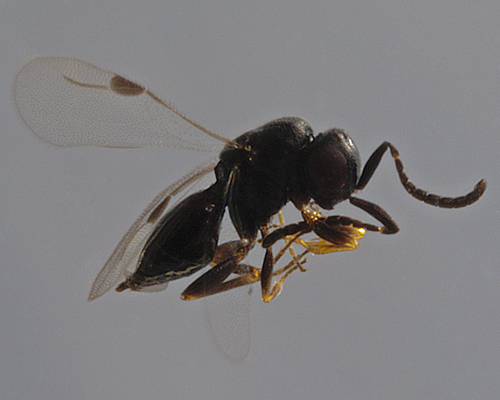 The clarified slide mounts below are of adult viviparous female Macrosiphoniella absinthii : wingless, and winged. 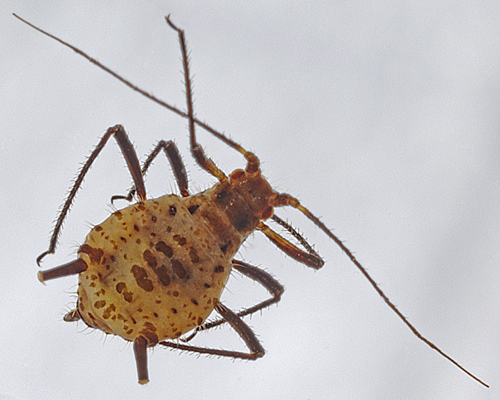 The absinthe aphid does not host alternate. Sexual forms (apterous or alate males) occur in autumn. It feeds on the upper parts of absinthe (Artemisia absinthium) and related species. It is not usually ant attended. Macrosiphoniella absinthii occurs in northern and central Europe eastward to Siberia and Iran. Macrosiphoniella absinthii is also found in north Africa and the Mediterranean area, and has been introduced to the USA, Canada and Argentina. 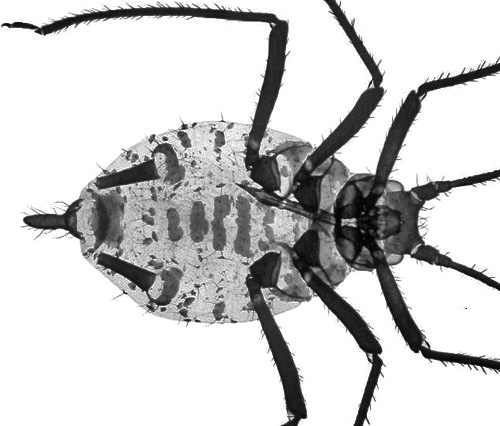 The first thing one notices about Macrosiphoniella absinthii is its dramatic black and white colouration, especially when one finds a large colony. This would appear to be a clear case of aposematic colouration for defensive purposes (Prudic et al., 2006) directed at bird predators. 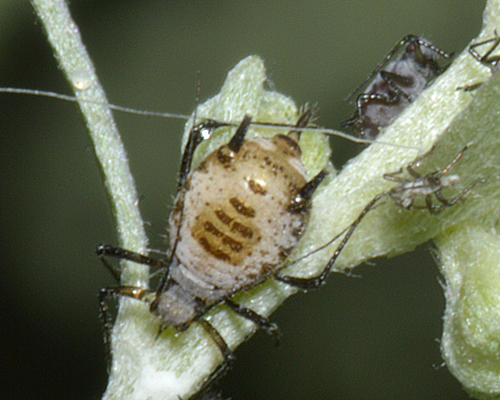 This could be Batesian mimicry (where the aphid is edible, but is mimicking an insect that is distasteful), but the presence of the toxin thujone in the host plant makes it more likely to be Mullerian mimicry (where the aphid is inedible, and is using a common warning colouration pattern). Alternatively the black and white colouration could be a form of crypsis, either pattern blending in amongst the flower head, or disruptive colouration where a block of highly contrasting coloration and sharp boundaries prevent a predator from detecting or recognizing the preys outline (Caro, 2009). Or could it have a dual function as Ruxton (2002) suggested for zebra stripes - cryptic when aphids are amongst the flower heads in low light and aposematic when exposed on the flower heads. Whatever the main driving forces are, the colouration certainly provides no defence against parasitoids. 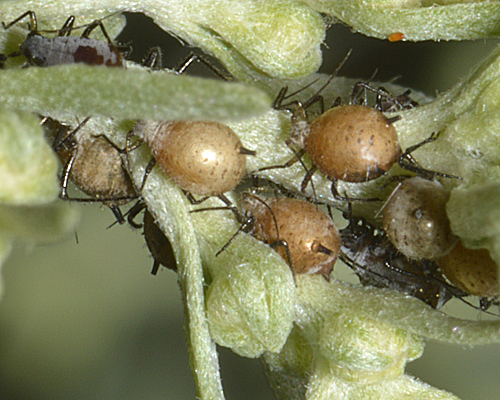 The first picture shows a group of aphids which were parasitized in the early nymphal stages, and mummified at the fourth instar stage. The second mummy was parasitized somewhat later and reached the adult stage before mummifying. This picture shows the primary parasitoid. 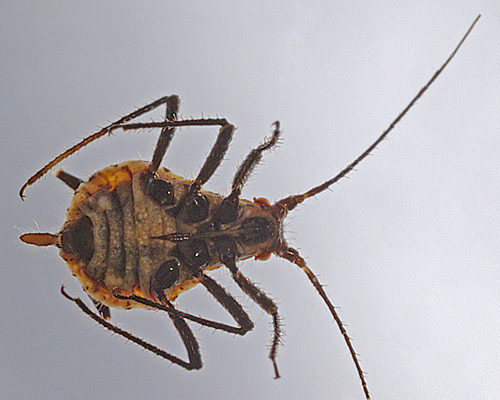 Identification is as yet unconfirmed, but it is most likely Aphidius absinthii. 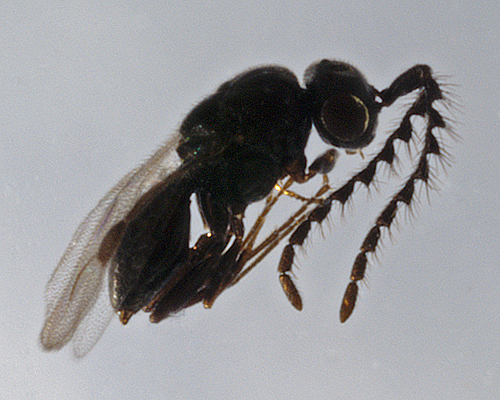 Macrosiphoniella absinthii is also parasitized by Praon absinthii. 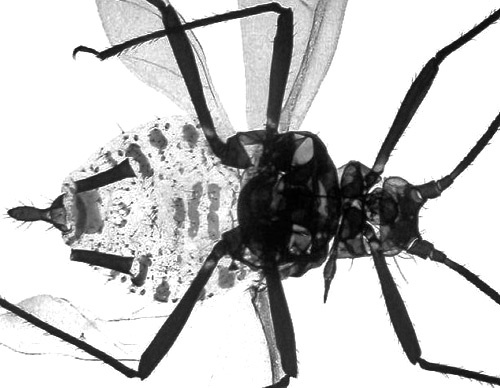 These pictures show some hyperparasitoids reared out from Aphidius mummies of Macrosiphoniella absinthii. The first is a cynipoid probably Alloxysta sp. whilst the two remaining pictures show a male and female Dendrocerus species. Macrosiphoniella absinthii has been recorded from 16 Artemisia species. 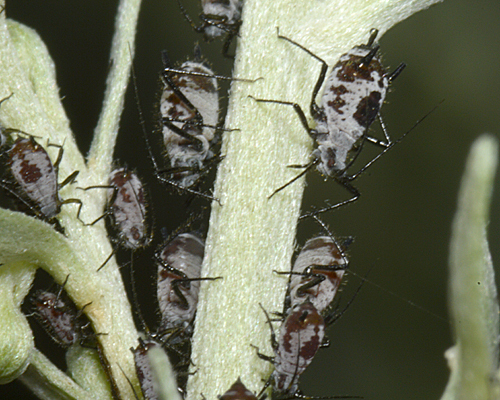 Blackman & Eastop list 35 species of aphid as feeding on absinthe (Artemisia absinthium) worldwide, and provide formal identification keys. 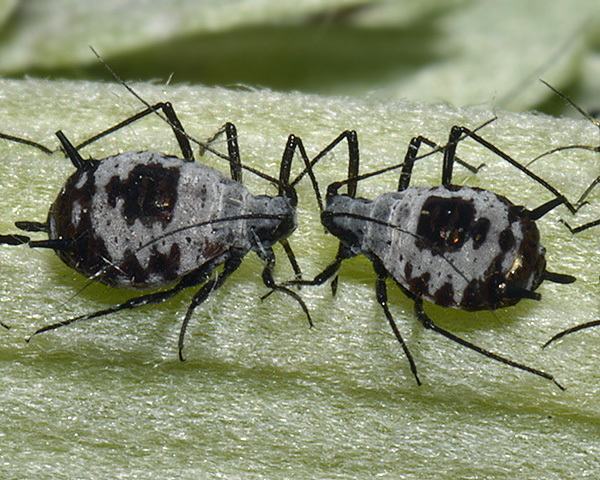 Of those aphid species, Baker (2015) lists 21 as occurring in Britain: Aphis fabae, Aulacorthum solani, Brachycaudus cardui, Brachycaudus helichrysi, Coloradoa absinthii, Coloradoa angelicae, Coloradoa artemisiae, Coloradoa heinzei, Coloradoa rufomaculata, Cryptosiphum artemisiae, Macrosiphoniella abrotani, Macrosiphoniella absinthii, Macrosiphoniella artemisiae, Macrosiphoniella oblonga, Macrosiphoniella pulvera, Macrosiphoniella tanacetaria, Macrosiphum euphorbiae, Myzus ascalonicus, Pleotrichophorus glandulosus, Protrama flavescens and Trama troglodytes.